Erica Dale Strzepek | ©2012 Please note as the artist and copyright holder, I retain all rights to reproduction. A snow day yesterday in the Berkshires of Western Massachusetts meant no school for my boys. Between naps, snacks, endless PBS shows, and shoveling I worked on some small 5×7 blank greeting cards. Their small size allows for quick, finished work, very rewarding feeling for me. I find my recipients are always charmed by a personal card. I snap pictures where ever we go, always with a painting in mind for later. 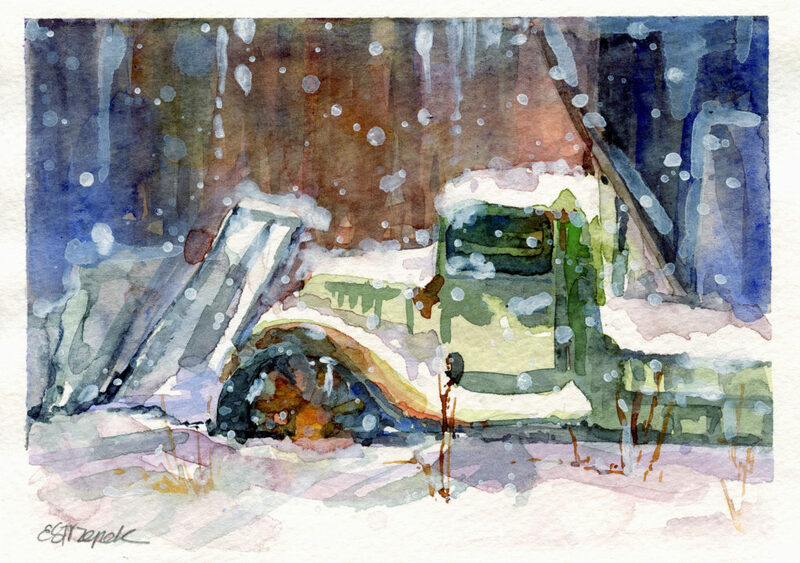 The theme of abandoned trucks is a favorite subject of mine, this group of work is from a site in Williamsburg, Massachusetts off Route 9. The drive along Route 9 provides beautiful vignettes of humble New England farms, the rambling Mill River, and the charming Williamsburg center including the Meekins Public Library and the Williamsburg General Store. We enjoy stopping a wonderful bakery, Bread Euphoria, located on the town line. Along Route 9, I have often admired a unique property cluttered with old steam engines, numerous pieces of farm equipment, various barns and out buildings with plenty of old vehicles. My Williamsburg series of blank cards is available for purchase from my Etsy Shop. Each card is an original painting, not a reproduction, each card sold separately.